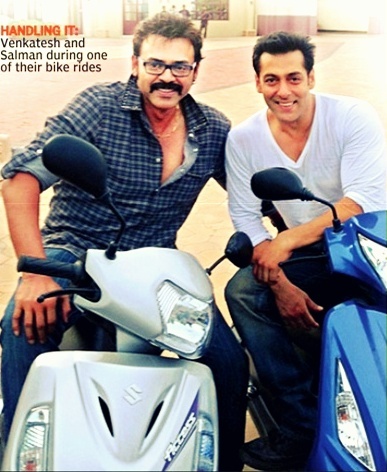 As we know , Salman Khan was very good friend of Victory Venkatesh. Off course Venkatesh did couple of Bollywood flicks. Coincidentally Venkatesh & Salman movie shootings were happening in RFC . In shoot gaps both the super stars roaming with scooters and discussing about their career’s. Local news paper asked about their bonding , then both of them expressed their interest in a Multi-starrer. Adding to it Venki confirmed that they are planning for a Bollywood flick. If it happens , delightful news for Venkatesh fans and Bollywood audience too. Above picture shows everything.